Devastating Wildfires Force California's Largest Utility To Plan Sale Of Gas Assets Senior officials at Pacific Gas & Electric are working on a plan to sell off the company's natural gas division to avert bankruptcy and raise funds to cover huge projected liability costs. The Camp Fire leveled homes in the Ridgewood Mobile Home Park retirement community late last year in Paradise, Calif. The state's largest utility, PG&E, may face billions in liability costs if its equipment is found to be responsible for igniting the fire. Facing staggering liability costs for its potential culpability in a series of deadly wildfires, the parent company of California's largest utility is exploring whether to sell off a major part of the company, NPR has learned. Internally, Pacific Gas & Electric has dubbed this strategy "Project Falcon." Under the plan, the company would sell its natural gas division this spring. After years of deadly errors and safety violations, the utility giant is looking for ways to cover liability costs and avoid bankruptcy, a senior company official and a former employee with knowledge of the plan tell NPR. All net proceeds from the sale of PG&E's gas division would be used to set up a fund to pay billions of dollars in potential claims from wildfires, the sources said. They requested anonymity because they were not authorized to speak publicly. The company also is exploring selling key real estate assets, including its San Francisco headquarters, and moving its operations elsewhere in the Bay Area, the sources say. On Friday, the company announced it would be"reviewing structural options" to best position the company to meet customer and operational needs. In addition, PG&E said it is searching for new directors for its board to "augment its existing expertise in safety." PG&E declined to make any senior leaders available to comment on Project Falcon. A written statement from spokesman Andy Castagnola said, "Safety is and will continue to be our top priority as we work to determine the best path forward for all of our stakeholders. PG&E remains fully committed to helping our customers and the affected communities recover and rebuild — and to doing everything we can to reduce the risk of future wildfires." In June, the state's fire agency, Cal Fire, determined that PG&E power equipment was responsible for sparking at least a dozen major fires across Northern California in 2017. And now, regulators are investigating whether PG&E equipment sparked November's Camp Fire, the deadliest and most destructive in state history. The company could end up having to pay billions from legal action stemming from the 2017 and 2018 wildfire seasons. Equity analysts project that PG&E's damages from the wildfires could exceed PG&E's market value and its insurance coverage. One Citigroup analyst estimates the company could be on the hook for up to $15 billion in damages. Insurance companies Allstate, State Farm and USAA have filed lawsuits against PG&E, blaming the utility for the Camp Fire. The gas sale strategy would have to be approved by the state regulatory agency, the California Public Utilities Commission, which has already expressed deep concerns about PG&E's shoddy safety record, lack of transparency and past efforts to pass liability costs on to the state's ratepayers. So far, state regulators and lawmakers have been kept out of PG&E's planning loop for Project Falcon, named for a group of peregrine falcons nesting on the roof of the company's headquarters. The current and former PG&E officials say they're speaking with NPR out of concern that senior management is not acting in the best interests of ratepayers, safety and the state. "There's a public trust element in being a utility monopoly," said the senior company official. PG&E is under no legal obligation to disclose its internal discussions about ways to stave off bankruptcy. But given the potential impact on ratepayers and taxpayers if the utility eventually needs a bailout, Michael Wara, a lawyer and research scholar at Stanford University, calls the lack of transparency "extremely disappointing." "They need to be thinking very hard about how to create safety for Californians rather than how to make money for shareholders when they're not being totally transparent, especially in the current context where there's a lack of trust and so many people that have been harmed by PG&E's infrastructure," Wara said. What California urgently needs and wants from its utilities right now is hard thinking about how to better protect communities from fire. And it's hard to see that going on. Wara added, "What California urgently needs and wants from its utilities right now is hard thinking about how to better protect communities from fire. And it's hard to see that going on." Wall Street wants to see hard thinking, too. Steve Fleishman, senior utilities analyst and a managing director at Wolfe Research, said PG&E's plan for dealing with fires in the future is unclear. "They clearly seem to be more at risk for that," Fleishman said. "This kind of risk profile is not sustainable." PG&E's stock is down about 50 percent since the Camp Fire broke out on Nov. 8. Consumer watchdog groups want any big move done with transparency. "Anything PG&E wants to propose should be done in an open, public manner and include a comprehensive, coherent wildfire mitigation strategy," says Mark Toney, the executive director of The Utility Reform Network. There is widespread anger in the state over PG&E's shoddy safety record. Protests broke out at recent public oversight meetings and at the company's San Francisco headquarters, where environmentalists and activists read the names of the more than 100 people combined who died in the Camp Fire and 2017's wildfires in Napa and Sonoma counties. At one customer service center, the company has installed bulletproof glass. In late December, state regulators said they were considering several proposals in response to ongoing concerns about the utility's role in a deadly gas explosion in 2010 and in the more recent wildfires. "PG&E has had serious safety problems with both its gas and electric operations for many years," the California Public Utilities Commission said in a statement. Possible changes put forth by the commission include splitting up the gas and electric divisions and either making the company a public utility or making the company's return on equity contingent on safety performance. "We must be careful and practical," the commission's president, Michael Picker, said in a statement last month. "This process will be like repairing a jetliner while it's in flight. Crashing a plane to make it safer isn't good for the passengers." The commission declined further comment for this story. A spokesman said only that state regulators are looking at a range of options for the utility. We must be careful and practical. This process will be like repairing a jetliner while it's in flight. Crashing a plane to make it safer isn't good for the passengers. In a separate development, the state's top law enforcement official, Attorney General Xavier Becerra, said in a court filing in late December that PG&E could face criminal charges up to murder if it's found liable in any of the recent deadly California wildfires. PG&E was convicted of felony safety violations in a gas line explosion in 2010 in a San Francisco suburb that killed eight people and destroyed a neighborhood. The federal judge overseeing the utility's five-year criminal probation in that case had asked Becerra's opinion on whether PG&E's possible role in the recent wildfires constitutes a probation violation. A sale would have big implications for the company, which supplies electricity and gas to more than 5 million California households and has more than 20,000 employees. PG&E's natural gas assets account for between 20 percent to 30 percent of the company. The company sources who spoke to NPR and provided supporting documents say the planning for Project Falcon began shortly after the 2017 wine country fires and picked up again in earnest this past June, when Cal Fire determined that PG&E was responsible for at least a dozen Northern California fires. The planning, the sources say, has accelerated since the Camp Fire. The sources also said the company would like to present its own plan before one is imposed by regulators. California applies "inverse condemnation" to utilities, meaning they can be held liable for damage even if they are not found negligent. PG&E shareholders and institutional investors may welcome a gas sale as a way to cover, at least in part, wildfire liabilities. As part of the gas sale plan, all gross proceeds from the sale would go into the wildfire fund with "no direct shareholder benefit from cash," according to the PG&E source. But shareholders could get new shares in the company that purchases the gas arm. 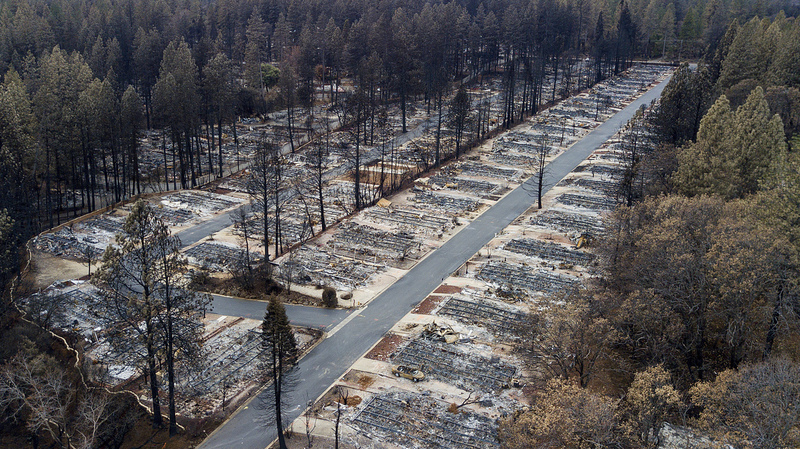 Regulators and lawmakers may argue that a deal should be structured to solely benefit wildfire victims and that any deal should come with protections for ratepayers. "We need to be asking ourselves hard questions as a state as to whether a settlement in bankruptcy might be better than something we get through this gas sale," warns Wara, the Stanford researcher. The inside sources say the company is hoping to get between $10.7 billion and $15.5 billion for its gas assets. Given the company's safety, liability and political challenges — including new allegations last month that the company violated safety regulations — analysts say it's not at all clear they would get that on the open market. In mid-December, state regulators found that PG&E had systematically falsified safety documents and broke safety rules related to its natural gas operations over a five-year period. At the time, PG&E spokesman Matt Nauman said in an emailed statement to NPR that the company is "committed to accurate and thorough reporting and record-keeping, and we didn't live up to that commitment in this case." This comes on the heels of a $1.6 billion fine from regulators — the largest in state history — and six felony convictions related to 2010 San Bruno explosion. Travis Miller, senior utilities equity strategist at Morningstar, is skeptical that a potential gas sell-off would fly with regulators or Wall Street. He said he doesn't think another utility would step forward to buy the gas assets. "You may get a good price, but it also carries with it a lot of regulatory and political risk," Miller says. "There's no good outcome for ratepayers under any scenario and not an ideal outcome for shareholders, either." The company's fiscal woes deepened in the wake of November's Camp Fire in Butte County, Calif., which killed at least 85 people and displaced tens of thousands who continue to face a desperate housing crisis. Paradise and neighboring towns were all but wiped out. The cause of the fire is still under investigation by the state's fire agency Cal Fire. PG&E has told state regulators that it experienced problems on two sections of its electric system near where the Camp Fire erupted. The company faces nearly two dozen lawsuits from fire victims over its possible culpability for the Camp Fire, including allegations of possible equipment failures and poor maintenance. In one lawsuit, residents accuse the company of prioritizing advertising spending over fire and public safety. "Now it's clear there are problems on both sides of the business," says Steve Fleishman, an analyst with Wolfe Research, referring to the gas and electric divisions. Fleishman says a gas sale and new management on the electric side might allow PG&E leaders to focus solely on improving safety. "I think the company is willing do anything structurally if they think it can help with safety," Fleishman says. Analysts warn that the company risks running out of access to capital, not just because of present liability, but also because of the risk of future catastrophic fires, a specter sharpened by climate change and a century of fire suppression policy in the nation's forests. The company in November said it had exhausted its revolving credit lines. And the ratings agencies, Moody's Investor Service and S&P, have downgraded the company's credit rating to near "junk" status. Internal PG&E planning documents on the potential sale, labeled "privileged and confidential," show that company officials are concerned about regulatory approval. "The CPUC approval process will be complicated and lengthy, so phasing the proceeding to obtain early decisions on matters that are crucial to the viability of the transaction is desirable," one document reads. While the gas sale would cover some liabilities, the legislature also may be asked to step in. State lawmakers partially shielded the company for liability claims in 2017 with a bill that critics called a bailout. Analysts and consumer advocates worry that lawmakers may expand that protection for this year and beyond, putting taxpayers and ratepayers on the hook. "Ultimately, we're going to be left holding the bag," says Michael Wara of Stanford University. "If PG&E can't pay all of these costs, then it's the California taxpayer that ultimately will." But some lawmakers are already balking. State Sen. Bill Dodd, who originally supported shielding PG&E from liability costs related to fires in 2017, has lost patience with the company. "PG&E has demonstrated a pattern of poor management and illegal conduct that has shattered lives across California," Dodd said in an emailed statement. He called for "systemic change, which must include change on the board of directors and in the executive suite."